Many unlicensed, non-commercial computer games based on Monopoly were distributed on bulletin board systems, public domain software disks and academic computer systems, and appeared as early as the late 1970s. At the time, Parker Brothers was unaware of this distribution until a user informed them of one version that stated "A Parker Brother game" on the title screen; the company then began enforcing its copyright and trademark on Monopoly. Over the years, Monopoly has been released for different operating systems on the PC and Macintosh platforms. The first of the legally licensed commercial adaptations began in 1985 for the BBC Micro, Amstrad CPC and ZX Spectrum. Versions have been licensed and produced for the Nintendo Entertainment System, Super NES, Game Boy, Game Boy Advance, Nintendo 64, GameCube, PlayStation, PlayStation 2, Master System, Genesis, Xbox, Xbox 360, PlayStation 3, PlayStation Portable, Wii, and Nintendo Switch consoles, as well as mobile device (PDA/Smartphone) versions. The Monopoly video games play by the same rules as the standard board game, allowing for single or multiplayer games. When a single player game is chosen, the game in question would generate computer-controlled opponents. 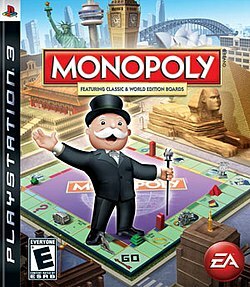 Monopoly for the PlayStation was developed by Gremlin Interactive, and a Windows and Macintosh version by Westwood Studios. The Windows/Mac version played top down, while the PlayStation version was in 3D. They both had cutscenes in common, played when showing the game pieces moving on their own. In 1998, Hasbro Interactive released a Monopoly video game for Microsoft Windows, which used 3D graphics instead of the top-down design used in previous versions. It ran on Windows 95 (although can be run on up to Windows XP, but won't work on Windows Vista and up) and had a special online play feature which used a modem. A new version developed by Electronic Arts was released in 2008 for the Wii, PlayStation 3, iPhone and Xbox 360, with a slightly stripped-down version for the PlayStation 2. It includes a transatlantic selection of boards, including the new Here & Now edition boards and new game mode, Richest. There are no online features, however. EA's Monopoly game scored fairly poorly, with a 54% average on the PS3 on Metacritic, and 56% on the Xbox 360. The Wii version fared better with 70%. The Official Nintendo Magazine in the UK were most positive in their evaluation of the Wii version, which they called "great fun" in the Christmas 2008 issue. Eurogamer was less enthusiastic, saying: "For the price of Monopoly for Wii, you could buy real Monopoly. Twice. Or you could just buy no Monopoly at all and spend the money on something more likely to inspire amity and harmony, like a book by Hitler." The Monopoly Family Fun Pack, produced by Ubisoft for PlayStation 4 and Xbox One, was released on November 18, 2014. It is an on-disc bundle consisting of the digitally-released Monopoly Plus and Monopoly Deal, as well as Monopoly Plus's My Monopoly expansion. In 2017, Ubisoft will release a more traditional Monopoly video game on the Nintendo Switch, which will take advantage of the Joy-Con's "HD Rumble" feature. An electronic handheld version of the game was marketed from 1997–2001. For several months in 2009, Google Maps hosted an online version of Monopoly, using its maps as the board. ^ Leemon, Sheldon (January 1988). "Go Directly To Jail". Microscope. Compute!. 10 (92). ABC Publishing. p. 30. Retrieved 5 July 2016. As it turns out, the company has been completely unaware of what was going on. It was not until a user named David Addison made and distributed a particularly detailed version of the game on the Amiga that Parker Brothers became aware of the problem. This program contained the phrase "A Parker Brother game" on its title screen, which apparently made someone think that Parker Brothers might be interested. They were not only interested, but appalled to learn how many computer versions were being circulated. ^ "Monopoly for Macintosh (1996)". MobyGames. Blue Flame Labs. 2016. Retrieved 5 July 2016. ^ "Monopoly Critic Reviews for PlayStation 3". Metacritic. Retrieved 31 December 2011. ^ "Monopoly Critic Reviews for Xbox 360". Metacritic. Retrieved 31 December 2011. ^ "Monopoly Critic Reviews for Wii". Metacritic. Retrieved 31 December 2011. ^ "Monopoly Review // The classic board game becomes a classic Wii title". Official Nintendo Magazine. Nintendo UK. 27 October 2008. Archived from the original on 12 June 2012. Retrieved 5 July 2016. ^ Gibson, Ellie (18 December 2008). "Wii Christmas Roundup". EuroGamer. p. 3. Retrieved 27 April 2010. ^ "Monopoly Coming To Nintendo Switch With HD Rumble Dice Rolling". Nintendo Life. April 13, 2017. Retrieved June 14, 2017. ^ "Electronic Handheld Game" (PDF). Hasbro. Parker Brothers. Retrieved 5 July 2016. ^ "Google-Powered Monopoly Still Under Construction". WIRED. 11 September 2009.